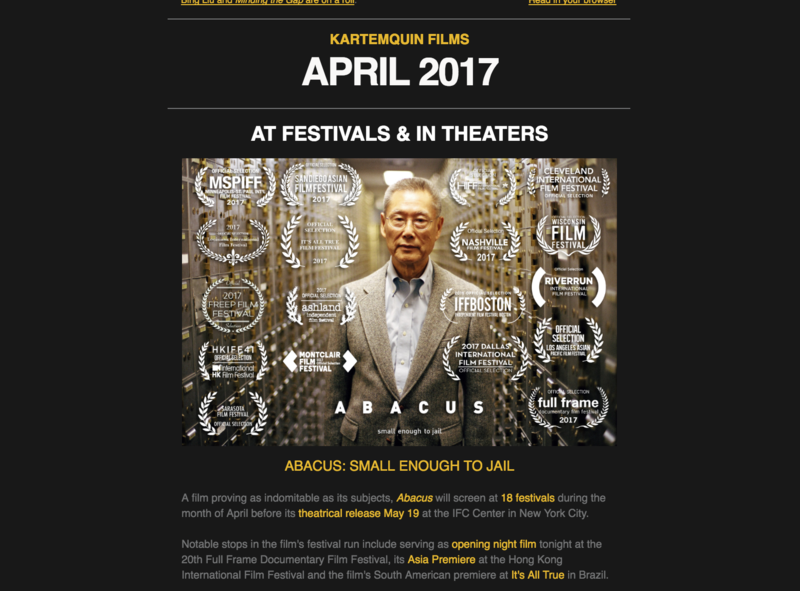 A film proving as indomitable as its subjects, Abacus will screen at 18 festivals during the month of April before its theatrical release May 19 at the IFC Center in New York City. Notable stops in the film's festival run include serving as opening night film tonight at the 20th Full Frame Documentary Film Festival, its Asia Premiere at the Hong Kong International Film Festival and the film's South American premiere at It's All True in Brazil. Also on the festival circuit, Raising Bertie took home its third award from an Atlanta-based festival, winning Honorable Mention for Best Documentary Feature at the Atlanta Film Festival. Edith+Eddie will have its international premiere at the 2017 Hot Docs Film Festival on May 2nd, May 3rd and May 4th. Unbroken Glass broadcasts on America ReFramed on May 16 at 8PM. On April 15th, the film and director Dinesh Sabu come to the Chicago Cultural Center for a free screening on April 15 at 2:00PM. Prisoner of Her Past is available for streaming and download worldwide via iTunes, Amazon, Google and VHX! The film will also re-broadcast for the 7th year in succession on April 23 at 2PM in honor of Holocaust Remembrance day.